Welcome to AMERICAS BEST VALUE INN CASINO CENTER LAKE TAHOE. 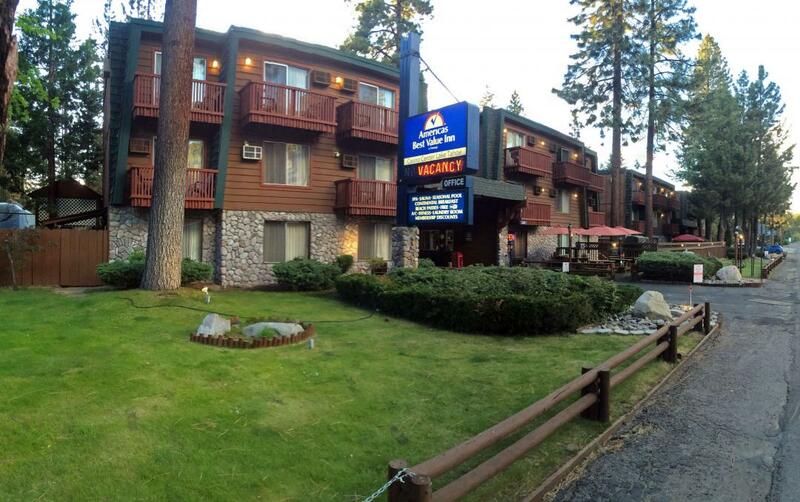 Our attractively landscaped Lake Tahoe style inn is ideally located only two blocks to famous Nevada Casinos like Harrah's, Harvey's, Mountbleu and the Horizon. We are two blocks to the shore of dazzling Lake Tahoe and private beach and marina facilities and only four blocks to Heavenly Village and Gondola, the most direct route to America's largest ski resort. A short block takes you to Edgewood Golf Course, rated #5 on the American PGA Tour and location of the annual Celebrity Golf Championship. Take a swim in our seasonal outdoor pool open May to September or enjoy our year around spa and sauna. Step inside the privacy of your own guest room with amenities including free wireless internet access, cable television, free local telephone calls and wake up service. All rooms are non-smoking with balconies on 2nd and 3rd floors. Upgraded deluxe rooms include refrigerators, microwave ovens and coffee makers. Some rooms have jetted tubs and MicroKitchens. With everything Lake Tahoe has to offer nearby including famous entertainment nightly and well known restaurants and buffets, you'll be tempted to have fun all day and stay up late to enjoy the lively Nevada nightlife. Regardless of why you come to Lake Tahoe, Americas Best Value Inn Casino Center Lake Tahoe is your BEST Choice for convenience, comfort and value. At Americas Best Value Inn Casino Center Lake Tahoe, We've Got You Covered from the time you hit the road until your head hits the pillow. Sleep easy with these features and amenities. Late check out allowed for a charge of $20 until 4 pm. After 4 pm will be considered a full day staying. Free daily continental breakfast served Monday through Friday 8am-10am and Saturday and Sunday 7am-10am. Looking for some quick grub or a nice dinner? Check out these nearby restaurants. Lew Mar Nel's, 0.2 mi. Harvey's Lake Tahoe, 0.3 mi. Lakeside Beach Grill, 0.4 mi. Fire and Ice Bar and Grill, 0.5 mi. McP's Irish Pub and Grill, 0.5 mi. The Naked Fish, 0.6 mi. Hard Rock Cafe, 0.7 mi. Chevys Fresh Mex, 1.2 mi. Coming with a group? Ask us about reserving group room rates. Americas Best Value Inn Casino Center Lake Tahoe offers one 500 square foot meeting facility with a maximum capacity of 15 guests. Check out these South Lake Tahoe attractions during your stay. Shops at Heavenly Village, 0.4 mi. Heavenly Village Cinemas, 0.5 mi. Edgewood Golf Course, 0.7 mi. Ski Run Marina, 1.3 mi. Bijou Golf Course, 2 mi. El Dorado Beach, 2.3 mi. South Tahoe Ice Arena, 2.5 mi. Campground by the Lake, 2.7 mi. Bijou Community Park, 2.9 mi. Stanford Sierra Conference Center, 13.6 mi.